X-Small (4-6) - $33.99 Small (6-8) - $33.99 Medium (8-10) - $33.99 Large (10-12) - $33.99 X-Large (12-14) - $33.99 Only 1 left! All know of the twin ninja clans who constantly fight throughout the land, secretly beyond the veil of our own perceptions. Well… obviously they don’t know the twin ninja clans or they wouldn’t be really secretly battling, but we have legends that make it all pretty convincing that they’re out there. We’ve rarely actually seen either of the Legion of the Dragon or the Ninja Avengers. Who knows what might have happened to us if we had, after all! The Legion are stealthy and fast with feats of dexterity that cannot be denied, working towards uncovering ancient relics for mysterious and dangerous reasons. They are contested only by the Ninja Avengers, equally talented masters of kung fu and weaponry, all while maintaining a fashion sense that that is equal part efficiency and avant-garde. But, how could they be fighting for dominance and remain so invisible? Well, it’s helpful that their trained stealth is aided by their unusual height! Indeed, epic tales are told about the legion of mini ninjas. They are thought adorable, called cute, and, worst of all, underestimated. Their candy-gathering prowess is not to be denied and, even after their successful missions have reached their end, noble Ninja Parents must keep a watchful eye lest this team sneak their own winnings up to their private bedroom lairs to snack upon their joyous rewards. 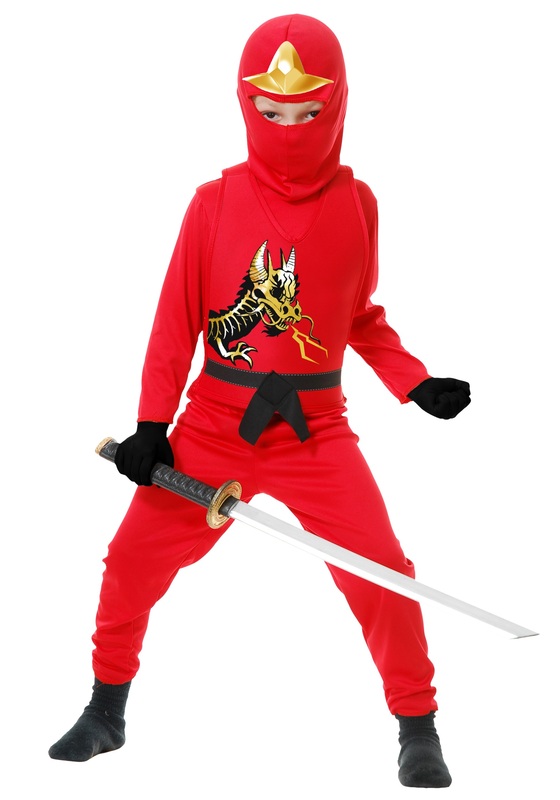 And it is time that your own tyke be raised up into the order with this Child Ninja Avengers Series II Red costume. These matching red pants and shirt are formed from ancient secrets and feature a printed black and gold dragon. The red hood has a hole for easy vision while also concealing the identity of your kiddo of the shadows while also displaying a golden patch over the forehead, the source of a few of the mini ninjas mystical powers. Accessorize your tyke with the ever-important weaponry and be ready to see the pile of candy that returns to your own mystic temple.